Boulder, CO 80301 Upholstery Cleaning, How to Clean a Microfiber Sofa. From sfgate. See more great home articles. The term microfiber – a fabric made of polyester and nylon that appears in products as diverse as cleaning rags, clothing and furniture – applies to fibers of 1.0 denier or smaller. Because of this fiber density, sofa makers tout microfiber as a durable, stain-resistant and low-maintenance alternative to cotton, leather and suede. Vacuuming and dry cleaning remedy many microfiber mishaps, but no sofa is impenetrable. Before creating a cleaning solution, check your sofa's tag – a “W” indicates that your couch needs a water-based solution, while an “S” calls for a solvent-based solution. Sofa tags with S/W cleaning code can be cleaned with either water based or Solvent based solution. Spray a clean, lint-free rag with your solution and blot the sofa to remove stains. Allow the sofa to air dry. Test your solution, especially solvent-based solutions, on an inconspicuous area of the sofa before using it on visible areas. Dry clean your microfiber sofa regularly with a vacuum cleaner or lint roller. Deep clean the sofa with a steamer, or hire a professional ike Cleancare to do so. Fill a clean spray bottle with warm water. Add 2 to 3 drops of mild dish washing detergent to the water, depending on the size of the bottle. Use only liquid detergent, never powder. Swirl the water by moving the the bottle side-to-side to mix the solution. Add a capful of white vinegar and 1 or 2 pinches of baking soda to the solution. These ingredients help fight odors. Replace the spray bottle's cap and shake the solution thoroughly. Fill a clean spray bottle halfway with warm water. Fill the remainder of the bottle with a solvent, such as ammonia, gin, rubbing alcohol or vodka. Replace the bottle's cap and shake the mixture vigorously. Never use bleach or fabric softener on microfiber fabrics. An “X” on your microfiber sofa's tag indicates that it should only be dry cleaned. Do not apply cleaning solutions to these sofas. Try Our Superior Upholstery Cleaning. 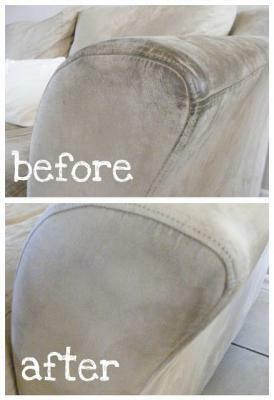 Get an Ottoman Cleaned For FREE!